Society has always benefited from volunteering. The idea of people giving their time and talents to help others with no expectation of receiving payment in return is timeless. What has changed is our attempts to quantify the value of volunteers, so that we can fully appreciate the magnitude of their contribution to our local and global community. Two recent studies do a great job of measuring the impact that volunteers have on our lives and the results are impressive to say the least. • If volunteering were an industry, it would employ nearly as many people as those currently working in education. • The global volunteer workforce is estimated at 109 million full-time equivalent workers. • The full-time equivalent size of this global volunteer workforce exceeds that of many major global industries. Interestingly, the theme of the UN Volunteers report is: The thread that binds, and it explores how volunteers are “weaving new patterns of resilience within their communities”. Every day we observe, and are grateful for, the many ways our volunteers contribute to the strength and resilience of the Threads of Life community. 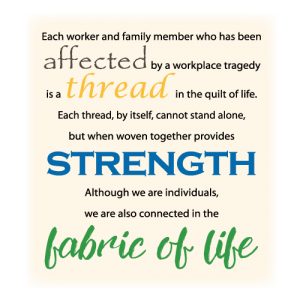 By supporting grieving families, speaking out for injury prevention, planning and attending fundraising events and providing leadership and support, our amazing volunteers are the heart and soul of Threads of Life. Each of our volunteers makes a unique and valuable contribution. Collectively, woven together, our volunteers contribute hundreds of hours each year to deliver our mission and vision, making Threads of Life a successful, sustainable organization, and also adding to the global volunteer workforce that is striving to make the world a better place. 2018 State of the World’s Volunteerism Report The thread that binds – volunteerism and community resilience, UN Volunteers, July 19, 2018. Lorna Catrambone is the regional development coordinator for Threads of Life in central Canada. She is an experienced fundraiser and non-profit professional. Personal stories, news and information.